When I first saw this, I had just seen The Handmaiden and Certain Women, and I didn't like it as much -- my standards were jacked up pretty high. But it was certainly the most haunting, lasting thing I saw that month, largely due to Rebecca Hall's performance. Mainly my problem was that the script didn't fully bring together either her depression or her professional struggle, leaving Hall to do all that work. A lot of what was going on in that workplace was super gendered, and while the script didn't shy away from that, I felt like it didn't really get down the nuances of what it's like to be a woman getting gender-y friction at work. Everyone seemed too consciously aware of what was going on. What it did really nail (and Hall did this too, of course) was the disconnect between Christine and everyone else -- her inability to see that there were many people who loved her and wanted to support her. While I struggled to connect with the portrayal of her depression per se, the sense that she was trapped in a closed system was incredibly strong. And the final scene of Christine's work friend alone in her apartment, catching the beginning of the Mary Tyler Moore Show, was perfect. Oh man. What a devastating movie. 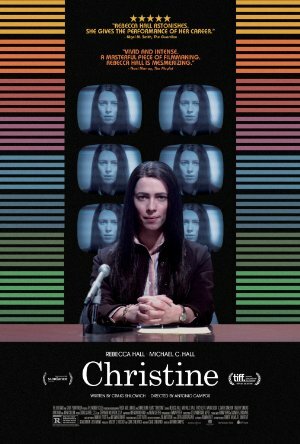 Rebecca Halls acting really makes the locked upness of Christine so real. And as you say people around her wanting to support her. Such a tragedy that she can't see that. None of the people around her are the caricatures that they could have easily been. A horrific real-life tragedy. The movie definitely handles the subject matter sensitively. I still get the shakes thinking about what she must have gone through in the last days of her life.